The Minister for Health and News Corporation has managed to breach the law, and a New Labour law at that, in his rush to protect front-line services from the ravages of the NHS. The high court has ruled that Jeremy C Hunt's attempt to reduce services at Lewisham hospital was in violation of the National Health Services Act 2006; it is certainly a tribute to the Bullingdon Club tradition of middle-aged men in a hurry that the Minister for Health and News Corporation cannot even chip away at the National Health without falling foul of legislation passed by that fanatic of state socialism, the Reverend Blair. The court gave Hunt leave to appeal the decision, in the best long-term interests of patients or (if you'll excuse the tautology) in the best short-term interests of Serco and its ilk; which, thanks to the taxpayers and unlike those in need of legal aid, Hunt can well afford to do. Lord Howell, a former energy adviser who discreetly left the Government three months ago, has recommended confining shale fracking to the desolate areas of the north, rather than to anywhere real people might be trying to keep an honest moat. Howell is the father-in-law of Daveybloke's best chum, the same who recently announced large tax breaks for fracking companies, and he was filmed last year by Greenpeace blathering that Osborne was "putting pressure" on Daveybloke over the "absurd" climate change targets which Britain's Head Boy was apparently not missing farcically enough at the time. Although Howell's remarks have occasioned a good deal of derision, they fit in perfectly well with the precedent set by Thatcherite governments, viz. all governments over the past thirty years. Much as British administrations of the fifties and sixties undertook a gradual retreat from empire in Asia and Africa, with occasional wog-bombings and concentration camps for appearance's sake, so the administrations from the sainted Thatcher to the present have undertaken a steady retreat from the less important areas of the United Kingdom. The old bag herself more or less formally abandoned Scotland, turning it into a toxic waste dump, nuclear launch bay and experimental laboratory for her own brand of poison gas for the uncivilised, the poll tax. Her chancellor, Geoffrey Howe, recommended "managed decline" for Liverpool and other tribal reservations; and by mid-century, if everything is satisfactorily managed, London will have been socially cleansed to the extent that Fortress Westminster can cower in peace behind its own version of the Righteous State's Fence of Friendship, while the proles and the immigrants fight it out amongst themselves in the wilderness beyond. A poor, unfortunate throwback to the days when the Liberal Democrats pretended to some vague interest in liberalism and democracy has accused Daveybloke's Cuddly Coalition of dragging its feet over an amendment to the anti-discrimination law. With bad grace, having been defeated twice in the House of Donors, the Government agreed this spring to amend the Equality Act 2010 and put caste discrimination legally on a par with racial discrimination. It is easy to see how this sort of thing must rankle with the Bullingdon Club and its fags: legal equality between wogs and Englishmen is bad enough, but the idea that the law should intervene to compensate for social differences resulting from accidents of birth must have given the upper echelons of the Conservative Party a severe case of moral indigestion. Accordingly, the whole business has been conveniently kicked into the long grass. The responsible department is Maria Miller's Department of Cultchah, Murdoch and Prolefeed, which gives some indication of how seriously the Bullingdon Club takes matters of equality; and the department has announced that employers, public authorities and the judiciary will need to be consulted for a couple of years before anything happens. This will probably delay the amendment until the summer of 2015, by which time the Conservatives presumably hope to announce the repeal of the Equality Act itself. If the untouchables don't like it, of course, they can always go home. Whether because her own minions have advised it on public-relations grounds, or because of the media's recent excessive sympathy towards the immigrant family of Saxe-Coburg-Middleton, Theresa May has come out as a diabetic. Whatever our personal regrets about her continuing immunity to pellagra, elephantiasis or stomach cancer, this is possibly the first intelligent thing she has done during her dismal career as Home Secretary. Type 1 diabetes may not push the sympathy buttons like a Death of Little Ivan, but it does call attention to the plight of the deserving non-health-tourist; it has enabled May to blather a bit in the Stürmer on Sunday about keeping calm and carrying on; and it's almost certainly a cheaper option than adopting a white working-class baby. It would, of course, be uncharitable in the extreme to suggest that May has made the announcement purely because Lynton Crosby has some clients in the insulin racket. One of the Reverend Blair's early successes, Sierra Leone, is the subject of a report by Christian Aid which has the temerity to suggest that land-grabs by foreign capitalists may not necessarily be a Good Thing. Since the civil war which his reverence, aided no doubt by his chum Baby Jesus, ended ten years ago, European companies have made the usual grandiose promises about the benefits of development. Landowners and company employees have indeed benefited, while lesser persons have had their land deemed "unused", their fruit trees cut down, their social structures undermined and their meals reduced. The companies have promised that matters will improve for the natives as soon as matters improve for the shareholders and the boardroom bonus claimants, who over the next ten years will suffer from nearly two hundred million dollars which the government has awarded them in tax breaks. Does Nick Agree With Nigel? A mere three days after its inception, the Deputy Conservatives are starting to register tentative objections to the Government's Powellite Pantechnicon programme. A spokesbeing for the Deputy Conservatives claimed that the programme was "not cleared or agreed by Liberal Democrats in government", but apparently it has taken this long for the Liberal Democrats in government to decide whether it's worth making a fuss over a few non-voters who will probably be deported in any case. Vans warning illegal wogs to "go home or face arrest" have been sowing peace and harmony among racially impure districts since Monday; the ex-minister Sarah Teather attacked them early on, but the rest of her party has been beaten to the punch by Nigel Farage, who condemned the billboards' tone as "nasty". The Farage Falange may want the wogs out, but it also believes in saying "please". By contrast, the Conservative Douglas Carswell fulminated that "it actually is an indication of a weakness that we're having to implore people to leave the country." Whatever happened to the good old days of New Labour, when we kicked down people's doors at three in the morning and dragged their children from their beds? Rah rah! Let us break out the smug! Let us squelch in a fat fleshy hug! In the depths of the pit that I've dug! This proves we were right not to quit! And look! Still more cripples to hit! Despite having been invited, the United Kingdom has refused to send a representative to the inauguration of Hassan Rouhani as president of Iran. The Ministry for Wogs, Frogs and Huns has had a sudden attack of Europhilia and has decided to follow the EU position, which is that the ceremony will be attended by diplomats already based in Tehran. Britain has had no diplomatic representation there since a mob attacked the embassy in 2011, and the Bullingdon Club is doubtless still smarting at the fact that a few angry rag-heads can do to Britain what all Davey's forces and all Davey's men couldn't do to Ecuador. As if that were not enough, Rouhani is a former nuclear negotiator whose lack of credibility as a frothing demagogue is a gratuitous insult to the Government's crying need for a fight over Iran's hardline stance on its weapons of mass supposition. He'll have to do better than that. Daveybloke's election strategist, Lynton Crosby, is a lobbyist for tobacco and alcohol firms, and Daveybloke has decided not to legislate for plain cigarette packaging or minimum unit pricing. Daveybloke's election strategist, Lynton Crosby, is a lobbyist for shale-fracking firms, and Daveybloke's best chum has just given shale-fracking firms a massive tax break. Fortunately for the repute and cleanliness of British politics, these are simply benign coincidences; Daveybloke's election strategist, Lynton Crosby, says so, and of course we must believe him. Britain's Head Boy has already issued a few weaselling denials, presumably because Crosby had not yet given him clearance to reveal the full magnificence of his honourable conduct. Now, however, Crosby himself has proclaimed that he did not have any conversation or discussion with Daveybloke on the subject of plain packaging. It would be uncharitable to point out that when a mouthpiece for Big Tobacco gives orders and a jumped-up junior salesman does as he's told, this may not necessarily conform to many people's idea of conversation or discussion. Lynton Crosby is unquestionably telling the truth; the fact is screamed from the rooftops by his very job title, which is so sacred a badge of veracity that it has previously been held by a member of the Murdoch press. I don't wish to bang on unduly about a notoriously non-discussable subject, but the sheer civilised charm of the thinking behind this seems to merit some little comment. Six London boroughs have instituted a pilot scheme involving advertisements aimed at illegal immigrants. Vans are to be driven around proclaiming "Go home or face arrest" and inviting people to text the Home Office for "help" with their repatriation. In an especially high-minded touch, the adverts will also inform legal residents of how many arrests have taken place in their area. Mark Harper, the flunkey who handed down the Lynton Crosby gospel on this particular matter, seems rather well chosen. He is a strong supporter of the Righteous State, apartheid and all; and he once nearly got himself lynched by his own constituents for defending the Government's proposed fire-sale of public forests - a particularly intelligent move given that his constituency is Forest of Dean. Three years ago he said on BBC radio, "There are definitely some people in our country, and everyone in every community knows who they are, who are able to work, and don't." Hopefully, then, if the pilot scheme succeeds, we will progress with due rapidity to incentivised denunciations, the general display of suspect addresses and official permission for spontaneous Kristallisations of public outrage. Asylum seekers have allegedly been evicted from homes that could be housing hard-working British families, thanks to subcontractors for G4S. Since refugees, like all so-called social care problems, are in fact a security problem, the Government very sensibly chose to deal with them by throwing three hundred and twenty-four million in taxpayers' money at the very same security firm which failed to provide security at last year's Olympics. Although G4S is rather good at accumulating money, it seems to have taken a rather relaxed attitude towards paying it out; in this case, to the landlords of the accommodation in which asylum seekers were housed pending deportation, imprisonment or some other patriotic reformation via the tabloids or the Farage Falange. Obviously, non-payment of rent means problems not only for asylum seekers but for landlords as well; and, doubtless on behalf of the latter, a parliamentary committee has been moved to investigate. The Government has indicated its support for a back-bench bill to pardon Alan Turing, who committed suicide after being convicted of gross indecency and chemically castrated, under the kind of laws that so many good Christian Conservatives would no doubt be happy to see revived. The bill will go through provided nobody tables an amendment; Turing's work in breaking German ciphers during the Second World War may possibly ensure a degree of immunity to any wrecking tactics by the likes of Peter Bone and Norman Tebbit, who might otherwise be worried about a slippery slope towards exhuming dead paedophiles and forcing royal infants to service them in public, or some such delightful fantasy. Britain's leading liberal newspaper proclaims the Turing bill a "change of heart by the government, which declined last year to grant pardons to the 49,000 gay men, now dead, who were convicted under the 1885 Criminal Law Amendment Act". Of course, even allowing the questionable premise that the Government has a heart to change, it is nothing of the kind. Unlike, say, Oscar Wilde, who was one of the 49,000 (and a self-proclaimed socialist whose cultural opinions would cause Maria Miller acute commercial indigestion should she happen to understand them), Turing was a military asset. He is being pardoned not because the laws under which he was convicted were grossly indecent, but because even the British Conservative Party has noticed that someone besides Winston Churchill might have helped win their favourite war. Australia, of course, famously owes its present civilised status to British penal policy, which provided for colonisation and the eradication of the expendable populace through the agency of exiled criminals. Doubtless to the satisfaction and envy of all patriotic Britishness-resources, the Australian prime minister Kevin Rudd has resurrected that honourable tradition in the interests of purging the nation's shores of that modern moral pestilence, the refugee. Anyone who sails to Australia seeking asylum will be instantly deported to Papua New Guinea, which has an island set aside for a detention centre and has set no upper limits on permitted overcrowding. Australia will repay this generosity with new aid, including "resettlement costs" and (which may or may not be the same thing) the expansion and refurbishment of the existing concentration camp. Besides all the other advantages, perhaps a pacific and final solution to the aboriginal problem is at last in sight. Rudd admitted that the whole business will "not be inexpensive", but has apparently not yet worked out just how little inexpense will be necessary. No matter: the only alternative would be to offer asylum to refugees on a case-by-case basis, which could lead in extreme cases to naturalisation, productive citizenship and increased taxpayers. Not even the United Kingdom, with its notoriously lax immigration policy and its population composed almost entirely of non-native speakers, is prepared to go quite that far; although both wings of the British Neoliberal Party and its little orange tail must be all of a flap with admiration for Rudd's sense of humour in spinning his cleansing programme as an attack on people-traffickers. The servodrone response from Tony Abbott, the Liberal-National Coalition leader, who called the policy a "promising development in offshore processing" but complained that Labor could not be trusted to implement it with sufficient harshness, will find particular ethical and aesthetic resonance in the British Labour Party. Police espionage on mobile phone and internet use has risen by fifteen per cent in the past year, and local authorities have got in on the act "in order to identify fly tippers, counterfeit goods traders and those engaged in consumer rip-offs". The interception of communications commissioner attributed the increase to the Olympics, which have been responsible for so much that has gone wrong in the country recently, including of course the continuing and inexplicable public enthusiasm for the National Health Service. Since the commissioner is retiring, he also managed to warn that the snoopery has the potential to become highly intrusive; doubtless the employers of Serco and G4S, to say nothing of the minions of Murdoch, will take the warning jolly seriously. Almost a thousand errors were made, including five wrongful detentions of people falsely accused of crimes; and of course it is to avoid such little inconveniences that the Government is busy abolishing the distinction between innocent and guilty in favour of one between affordable and non-affordable. The Reverend Blair's proto-Israeli predecessor, as we know, was much criticised by his enemies for dining with sinners and publicans; and it appears that our own Saviour, during his earthly ministry, may have suffered similar difficulties in choosing his chums. The first major New Labour scandal, some years before his reverence took on the sacred mantle of poodle and joined the White House chimpanzee in butchering Asians, was much the same sort of thing as Lynton Crosby has landed Daveybloke in this week. Bernie Ecclestone, a wealth creator with ties to Formula 1 motor racing, switched his political allegiance from the Conservatives to New Labour, apparently on the sensible grounds that New Labour were in office and the Conservatives were not. Ecclestone then donated a million pounds to Labour party funds, and offered another million which, in a quaint throwback to more innocent days, the chair of the commission on standards in public life advised Labour to refuse. Labour was in the process of introducing a ban on tobacco advertising, which Ecclestone opposed; and by the usual benign coincidence it later happened that Formula 1 racing was exempted from the ban. Tessa Jowell, the health minister whose husband did so much to help Silvio Berlusconi with his finances, argued in favour of the exemption, and it seems the Reverend Blair was swayed. It was even alleged later on that his reverence had said the thing that was not about the donation; which, in light of his later record, just shows how mean people can be. Even now, some ghastly foreigners are indicting Ecclestone on, of all things, a bribery charge. Imagine that. The commissioner of the Metropolitan Firearms and Headbangers' Club, Sir Bernard Hogan-Howe, has issued what is evidently meant to pass for an apology over the identity theft perpetrated by police spies on dead children. He began like any celebrity who has just made a bigot of himself in public, and said he was sorry about the shock and offence which certain intolerant persons have decided to take. He went on to emulate the Archbishop of Canterbury, who in the recent debate over equal marriage apologised for centuries of Christian ill-treatment of homosexuals before arguing that they should continue to be treated as second-order human beings. Hogan-Howe pronounced the identity theft "morally repugnant", and then refused to expose the perpetrators of the moral repugnance on the grounds that they might get caught. Hogan-Howe finished up by saying that if only the police had been allowed to go on sneaking around in peace, nobody would have been hurt; which for sheer ethical fortitude rivals Nick Clegg apologising for having made a pledge. The lawyer for one family called the statement a PR exercise, which seems unduly flattering. Despite the intrinsic pessimism of the Christian faith, with its unpleasant doctrine that Iain Duncan Smith is partly immortal, it seems there are some comforts. Like George W Bush and his reverend poodle, when confronted with mere facts Duncan Smith can always fall back on belief: the Office of National Statistics may say one thing, but Duncan Smith believes that he believes something else; and furthermore he believes that his belief is true. For whether there be statistics, they shall fail; whether there be mathematics, they shall cease; whether there be integers, they shall vanish away. Indeed, such is the power of belief that Duncan Smith's frère et semblable on the Milibeing team, Liam Duncan Byrne, is expected at any moment to condemn his lack of faith and to demand that he confess the immanent reality of Santa Claus, patron saint of children, pawnbrokers, salesmen and thieves. You might think, if you happened to be a terminal optimist, that having served as arguably New Labour's most abject foreign secretary in a far from uncrowded field, with his two most memorable achievements being the swindling of the Chagos Islanders and the panicked appeal to the United States for a note to Teacher excusing his collusion in kidnap and torture - you might just possibly think that the Other Milibeing would prefer to sneak out of the country quietly before taking up his Thunderbirds post in New York. But not a bit of it. Prominent among the many attributes which the Other Milibeing shares with the Reverend Blair is an ironcast immunity to the knowledge of when he isn't wanted. The Other Milibeing has been speechifying about Iraq and Afghanistan; and while he admitted that everything has not been exactly ticketty-boo for the past ten years or so, he has been wagging his finger at the "international community" for letting a couple of unmitigated disasters deter it from jumping into the fray all over again. The Other Milibeing sermonised about learning lessons; again like the Reverend Blair, he has clearly remained immune from the lesson that it is best not to go on lying once you have been caught: "There were no WMDs and if we had known that in 2003 then there would have been no justification for war." The Other Milibeing registered annoyance at al-Qaida for not abiding by George W Bush's Mission Accomplished sign: "In Iraq, the war was won easily but the peace has often looked like war"; and worried about Afghanistan descending into "a new kind of civil war" now that the crusaders are leaving. Perhaps the whole adventure should have been more about oil. Apparently the Other Milibeing thinks somebody ought to do something about it. Well, here's a thing: some middle-aged men in a hurry have suddenly come over all leisurely. Having previously threatened to enforce plain packaging on cigarettes and minimum unit pricing on alcohol, the Government has now decided to wait for some evidence from Australia. Apparently, the evidence on which the original decision was made has been examined and found wanting by Daveybloke's new best chum and sometime tobacco lobbyist, Lynton Crosby, who has urged Britain's Head Boy to stop being sidetracked by inessentials like public health and get back to kicking immigrants. There have also been the inevitable squeals of outrage from the industry about the apocalyptic effect on manufacturing and retail, the risk of black-market activity and the costs to the Exchequer; all of which arguments no doubt made a powerful impression, since they are more or less the ones used by Daveybloke's chums in the banks against banking regulation, and by Daveybloke's chums in the scumbag press against scumbag regulation. The greenest government ever, in the person of that famous environmental adornment Eric Pickles, has approved the extension of a Kent stone quarry into an ancient woodland site. The Government's new planning regulations, which were slightly watered down from the original attempt to expel from the shores of Albion all pretence of planning or regulation, stipulate that irreplaceable habitats should not be destroyed "unless the need for, and benefits of, the development in that location clearly outweigh the loss". As we all know by now, in the scales of the British Neoliberal Party's judgement nothing outweighs the benefits of corporate profit, and there is nothing in England so ancient or so traditional that it cannot be replaced with a reasonably-priced plastic substitute. A spokesbeing for Pickles' department said that "the land will be restored in due course to native woodland", but wisely refrained from specifying either the restoration's time-scale or its agency. Most governments suffer an embarrassment of statistics; and the embarrassment is even greater when a government contains the likes of Iain Duncan Smith and Michael Gove, who either don't understand their own statistics or simply make them up. Accordingly, the Office of National Statistics is being incentivised to wind down the processing of any information which might prove inconvenient to the Bullingdon Club. Naturally, this includes figures on public health: smoking, drinking, teenage pregnancies, infant mortality and other good old-fashioned Conservative hobbies may all soon be freed from the oppressive gaze of the State. There are also proposals to stop analysing the labour market, pensions and the productivity of the hated public sector; and to impose a strict work-to-rule régime when analysing data about causes of death. Even Daveybloke's well-being thingy could suffer a significant reduction in scale. Britain's Head Boy and his fellow ascetics will just have to find another way of informing Food-Bank Britain that money isn't everything. Some uppity scroungers in the hated public sector are complaining about the Government's asset-stripping of their workplace. The "Crown" in Crown Prosecution Service should deceive nobody; the CPS is a public asset and hence, like Royal Mail, ripe for privatisation, with the monarchy formally relegated to its proper constitutional role as just another corporate brand name. Accordingly, the CPS' budget has been slashed by more than a quarter, in order that more cases may be lost, more criminals let loose on our streets and (oh, the humanity) fewer people put in jail or handed over to the mercies of a contractor for profitable suffocation like G4S. The statutory watchdog has warned that cases are not being adequately prepared, and that police officers are taking over the duties of prosecutors without also assuming the duties of judge, jury and executioner which are so frequently necessary for them to get away with it. A recent kidnapping trial in Southwark collapsed on a technicality at a cost of three million pounds to the taxpayer, who fortunately can afford it just as well as ever; although it seems Chris Graybeing and his team have not yet decided whether the problem lay with the presumption of innocence alone, or with the rule of law in general. Some senior judges have granted one of Daveybloke's stupider relatives a privilege long ago sacrificed on behalf of the rest of us by the high priests of national security: the privacy of the heir to the throne remains inviolable even when he attempts to influence those functionaries who run the country for the greater good of G4S and BAE Systems. Drawing on some superhuman reserves of energy which miraculously remain to him after yet another day of waiting for his mother to die, the prince has been in the habit of firing off hand-written notes with useful advice for the Government. The possibility that these epistles might be published sent the attorney general, Dominic Grieve, into an undignified scramble to keep the prince's pearls of wisdom from the public's porcine eye; and the judges have now ruled that Grieve was correct, if constitutionally aberrant, to do so. Should the public see the letters, its perception of the prince's political neutrality would be fatally compromised, and this would be a Very Bad Thing. The mere fact that the prince wrote the letters in the first place is really no problem at all, because the prince is being "instructed in the business of government"; they are, it would appear, not so much crank missives as essays towards an Open University course in political cosiness. The lord chief justice noted that Grieve's constitutionally aberrant overruling of a previous court decision was not quite pernicious, because Grieve's decision could be challenged in another court (as it was, by the Guardian) and upheld for the protection of the royal dignity (as it was, by the lord chief justice). This neat little circle of old-boy civility "provides the necessary safeguard for the constitutionality of the process". Pause a moment, if you will, to admire the car-crash Osbornomical Britishness of this: as a North Atlantic island nation which has occasional access to wind and waves, and which has recently changed from a net exporter of wheat to a net importer, we are opening the biggest establishment yet dedicated to the burning of wheat. The timing is all the more brilliant in that the previous biggest such establishment, which is all of two years old, has been offline since the spring because of the high cost of feed stock. Perhaps because of the unfortunate location (somewhere or other north of Cambridgeshire), it does not appear that anyone from the greenest government ever was available to cut the ribbon, as Britain's Head Boy recently did at the London Array; and this despite the possibility that biofuel production will turn conserved areas into cash-crop farms, increase greenhouse emissions and starve the proles into the bargain. In the wake of the latest series of little faux pas by the Metropolitan Firearms and Headbangers' Club, the policing minister has been driven to stern measures: he's going to tell all the police forces in England and Wales to investigate themselves. The minister is expected to make it jolly clear to the chief constables that all evidence of misconduct must be brought out into the clear light of day, with no shilly-shallying and no little accidents of the News Corporation variety. "We may discover some very unpalatable truths," the minister said optimistically; fortunately the distastefulness of the veracity will be somewhat diluted by the cosmic unlikelihood of any culprits being brought to book. The minister is also expected to announce a new code of ethics for police officers, which may possibly make a bit clearer the role which dirty-tricks operations ought best to play in police dealings with protest groups and bereaved families. It is as yet unclear whether the code will be binding or merely advisory, like the law of the land. I am sure we all sympathise deeply with the Christian state of Missouri, whose attorney general is having just the most awful time ensuring that prisoners are done to death according to legal schedule. Missouri usually bags its offenders with a lethal injection, so the boycott on sales of medical drugs for executions has resulted in a bit of a problem. Normally executions are carried out with a cocktail; Missouri tried to save itself time and trouble by simply administering anaesthetics large and straight, but twenty-one death row inmates kicked up a fuss over the "unprecedented, substantial likelihood of foreseeable infliction of excruciating pain". Doubtless those perennial excuses, the victims and their relatives, would have nothing against the premeditated infliction of excruciating pain; but there remains some doubt as to whether it would be in keeping with what is left of the US constitution. The Missouri supreme court has refused to schedule any more killings until the matter is settled, which means the attorney general is all of a tizzy trying to look sufficiently tough on crime. He has pleaded with the court to be allowed to execute just a couple of inmates before the drugs run out, and has also made the constructive suggestion of bringing back the social cleansing methods favoured by that great American, Adolf Eichmann. Even so, a spokesman for the Death Penalty Information Center claimed that this may be nothing more than an attempt to prod the supreme court back towards the more civilised, enlightened and compassionate option of strapping people to gurneys, paralysing them and stopping their hearts. The Catholic church continues its long and painful journey into the modern age with a bit of instant sainthood. In the church's younger days, the process of canonisation could take decades or even centuries; now, in the church's endlessly prolongued senility, a man can be hustled into the holy company with all the unseemly haste of an elderly cardinal fumbling his final choirboy. The Vatican has announced the impending sainthood of Pope John Paul II a mere eight years after his death and two years after his beatification by his own former Grand Inquisitor, the sixteenth Daddy Goodspeak. The beatification was itself fast-tracked, with the normal five-year waiting period being waived because of "exceptional circumstances". Evidently the church's famous rigidity and dogmatism apply only to its less illustrious members; quite possibly the sixteenth Daddy Goodspeak has hopes of undergoing his own beatification without the inconvenience of dying first. Nevertheless, given the patchy record of the Wojtyla-Ratzinger cabal in defending the church against the calumnies of the Jewish-homosexual secularist press, a few devil's advocates have naturally emerged. Presumably it is for the hardness of such hearts that the Vatican has also decided to chuck Pope John XXIII into the bargain bin of sainthood. The need to reform political party funding is agreed by both wings of the British Neoliberal Party and its little orange tail, and a commitment to do something or other about the problem was in all three manifestos, along with all those other little jokes about electoral reform, removing the structural deficit and preserving the National Health Service. Accordingly, the parties have gone off together to sort things out, and have discovered considerable common ground in refusing to countenance any reform of political party funding. Labour refuses to change its relationship with the unions, while the Conservatives and their little orange fags shake their heads sadly at such boorish intransigence. Faced with the prospect of yet another forced head-wash in the Bullingdon Club lavatory, Nick Clegg appointed his financially scrupulous chum David Laws to try and keep up the pretence of negotiations; but it seems the seniors were in a disobliging mood. Clegg responded with an extended whine about trade unions on his toy radio programme, though doubtless not without having first obtained due clearance from the representatives of Lord Ashcroft, Rupert Murdoch and other genuine working people. The Minister for Justice, Heterosexual Hostelry and Profitable Incarceration, Chris Graybeing, has been lecturing the legal profession over its quaint and fusty penchant for defending non-paying customers. Graybeing, who has almost as many legal qualifications as the Minister for Health and News Corporation has medical, wants to reduce by seventeen and a half per cent the fees paid for representing those who cannot afford to pay their own lawyers; this will automatically kill off law firms which make most of their money defending poor people. What can possibly be wrong with that? Some of the firms will merge; others will doubtless be taken over by the likes of Serco, G4S and other specialists in crime: a process Graybeing calls "consolidation". When the likes of Serco and G4S take over the police as well, this will merely consolidate matters yet further, and the lucky offender (suspect, in Oldspeak) will get a much smoother ride, all the way from targeted arrest to tabloid-sanctioned punishment. Graybeing also proclaimed that plans "to impose a one-year residence test for legal aid would also be re-examined in relation to the way in which they would affect children under 12 months old". Banging up foreign babies along with their mothers, it appears, will have to wait until the 2015 manifesto. Someone has apparently been telling Daveybloke's mad old cat lady a few stories about the misuse of police stop-and-search powers. Even after more than a decade of New Labour action on civil liberties, and three years of reform by Daveybloke and his cuddly chums, black people are still seven times more likely than whites to be stopped and searched. Accordingly, Daveybloke's mad old cat lady has launched a six-week consultation in order to find out whether this is a Bad Thing or not; particularly in light of the Government's continuing efforts to ensure that the only dusky types to get into the country from now on will be the nice ones. Daveybloke's mad old cat lady registered some concern at the fact that only a small percentage of searches lead to arrests, and hence to fodder for the Ministry of Profitable Incarceration; doubtless the representatives of the Metropolitan Firearms and Headbangers' Club will be happy to clarify what extra powers of arrest will be necessary to improve matters. Perhaps the occasional domestic drone strike might help. My historical epic, Closing Time at the Gallows and Glockenspiel, is now available for purchase as paperback or ebook. 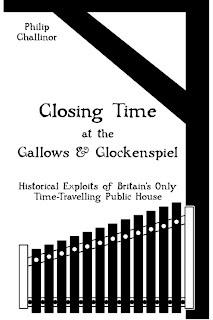 It chronicles various lurches around the space-time continuum by the United Kingdom's only known time-travelling pub, and includes all the episodes published on the present weblog besides a good many new ones. You are advised, as usual, to purchase with alacrity, peruse with admiration and review with assiduity, while I await the call from the Department for Education.